Along with other sets of carving tools we stock the Chris Pye sets of basic carving tools. But don't think this blog is merely a plug to sell that particular set, it's not. As a professional iron monger I do want you to buy tools, lots of tools, and from my company, not from the guy down the street. But, that being said, if I don't sell you the right tools, especially when you are starting out, then we will lose you as a customer, and of course we earn roughly the same amount of money no matter what you buy so it is in everyone's interest that when asked (and this happens on a daily basis) we recommend the right stuff. 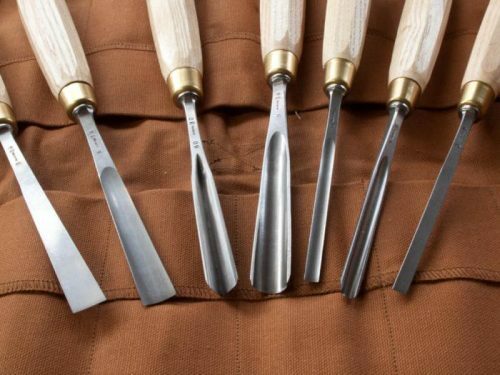 Here is the problem: Just about anyone on the planet who teaches carving recommends between a half dozen to a dozen tools to start out with but nobody agrees on WHICH half dozen or dozen tools to start with. There is a overlap of course, but different teachers teach different ways, different techniques, and also within the world of carving there are tons of different approaches. Also, teachers as a group would much rather their students start out with the same tools each time so that students can easily follow along with the examples and exercises that the teacher assigns. In my case, my teacher Chris Pye wanted me to have the following tools to start so that I could do the first exercises in "Woodcarving Course & Reference Manual": #39 V 60Â° tool x 3/8in. 10mm, #2 Skew chisel x 3/8in. 10mm, #7 x 1/2in 14mm, #5 x 3/8in. 10mm, and a #9 x 1/8in. 3mm. As it happened we were out of the stock at the time on the Ashley Iles #39 3/8" so I am using a 5/16" instead which turned out to be fine. Pye's seven piece set from Auriou, which I mention above - has very little overlap with the tools I needed for the exercises. A year later , since I already have the tools I need and then some, I don't need the set. But for a lot of people just starting out getting the set solves a lot of choice making. Unless you are studying with someone else than Chris Pye. We don't have an axe to grind on which tools to get so we give a 10% discount on 6 or more on Ashley Iles tools bought at the same time. This way you can make up your own set. During the first weeks of class, as your teacher is teaching a wide variety of cuts and holds and you get your first hopefully broad range of assignments you will be using the entire set of tools the teacher recommended. Then everything changes. As you figure out what you like to carve you will also begin to figure out which tools you need. More large tools, more small tools, Full sets of sweeps because you are doing lots of curves. Big wide chisels for lettercarving, it varies from person to person and it is hard to predict. What you should do is buy tools as you need them. If you make a mistake and find out you don't use the tools you have a year to return them. More importantly you have a year to figure out if the tool speaks to you. A suggestion: If you get a mess of tools all at one go - from any vendor - even if they come sort of sharp they probably won't be classroom ready sharp. Using Chris's term, you have to "commission" your tools. It may seem to make sense to sharpen everything up at once but don't. The reason is that being a beginner it better to first sharpen the first few tools from start to finish, get them working correctly, work on your sharpening skill, correct any problems, and then sharpen the rest when you know what you are doing. If you are not studying with a teacher and you are learning from a book getting the tools as you need them, or making up your own set is what we recommend. You can learn and do amazing things with one tool, or two, or whatever works with your budget. The five tools the Chris recommended to me for my studies took me through all the basic exercises and as I have gotten more practice I'm adding a few tools as I feel I need them for specific projects. I really try to justify each purchase because it's easy to get carried away. Most of the time it makes sense to adapt your project to use whatever tools you have on hand. And of course the fewer tools you have, the fewer need to be kept sharp and readily accessible. Thanks for the article, and I get the ideas you are presenting to us, but from a purely "quality" perspective, whose tools do you prefer? As a small business, all other things being equal, I would prefer purchase from a small, US company. But it sounds like all of these chisels are produced overseas. I have the Ray Illes mortising chisels, and like them, is his brother as skilled at carving tools? IS the quality of the Illes chisels higher than the others? These are just some other things I consider, but the "quality" is of course first. Any additional advice for me? There are no American makers of a full line of traditional carving tools. Ramelson and a few other companies make some styles but they don't forge bolsters and other details. Several other companies sell tools stamped from sheet steel. Even a century ago carving tools were imported from Europe. Buck Brothers, an American company did sell a small range of carving tools but IIRC they were imported. I like all tools. Most of what I use is from Ashley Iles. I like their tools a lot, they are less expensive than some others because we import directly from them, they have a huge range, and Barry and Tony and Ray Iles are friends of mine. They are also fabulous tools to use and feel really good in the hand. Barry has 40 years of toolmaking under his belt. If you click on MET - the last button on the menu bar toolsforworkingwood.com/met we have some fine videos of Barry and Tony making carving and turning tools. We also stock Two Cherries tools which is also a fine brand and some people like one brand better than the other. It's a personal preference. I enjoyed meeting you at your shop and choosing a set of tools. I am excited to get started using my auriou tools.